Penne pasta, kimchi, meatball mix! 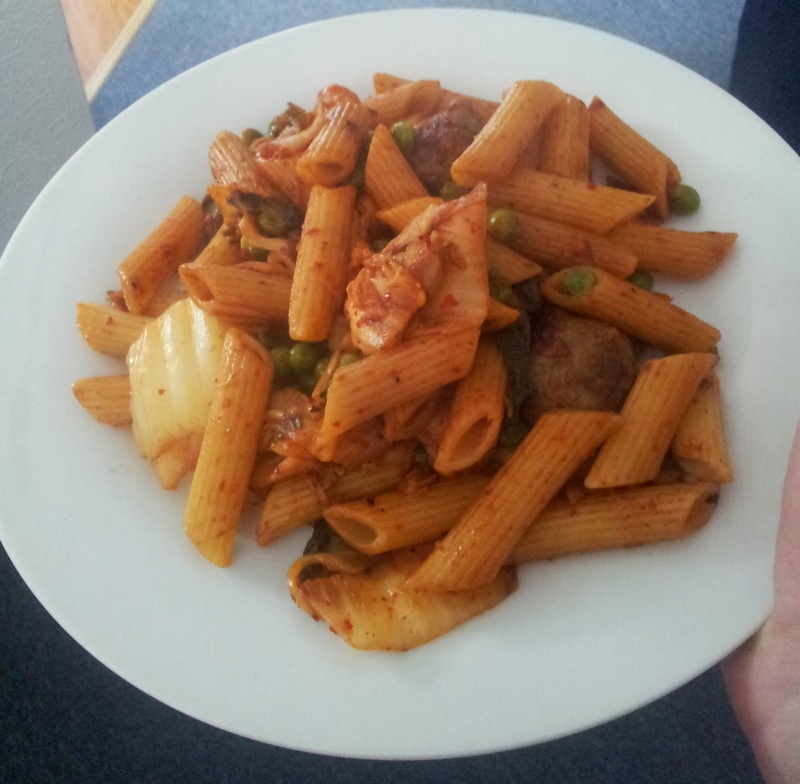 So, I had some meatballs from Aldi, some penne pasta still, frozen peas, kimchi, oh and I found a packet of Shin Ramyun flavouring too. I boiled the pasta as usual and started frying the meatballs. 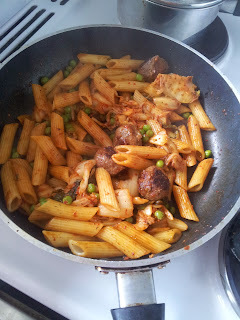 After they were mostly cooked I added in the peas (frying still), then the pasta and finally the kimchi. I sprinkled the flavour powder on, and continued to stir fry it for another minute or so, to let the flavours meld together. It was surprisingly good! There was a hint of kimchi, while the flavor sachet added was nice, and mixed in like this wasn't even too hot, as it is with the noodles. The meatballs took on the flavours of everything, plus the herbs and spices that were already in them. And the pasta ended up tasting like the shin ramyun powder and a little of the kimchi. I've found that cooking to the kimchi takes some the fermented flavour out with can be a bit strange at times, while still leaving the spices and healthy goodness too it. Plus the peas gives it some greenery too! 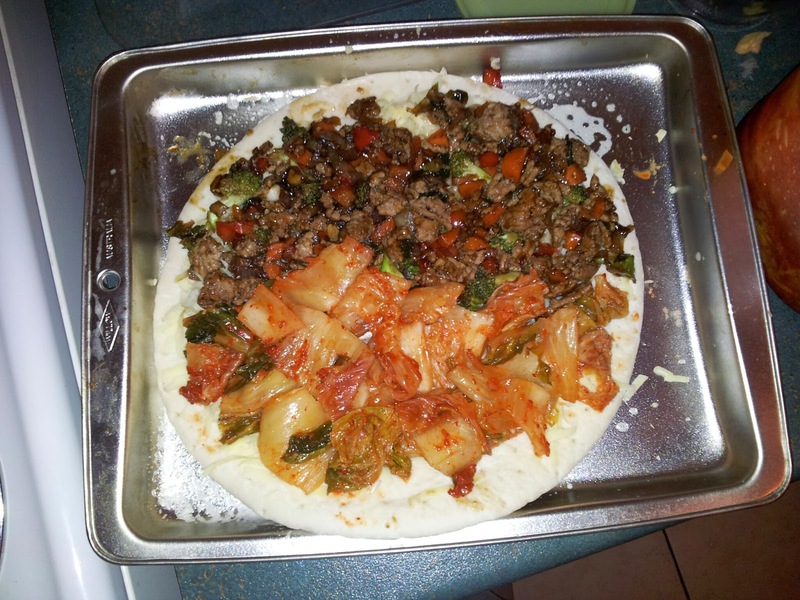 My girlfriend and I made a few pizzas one night a few weeks after we got back from Korea, not finding any restaurants there that sold kimchi pizza. 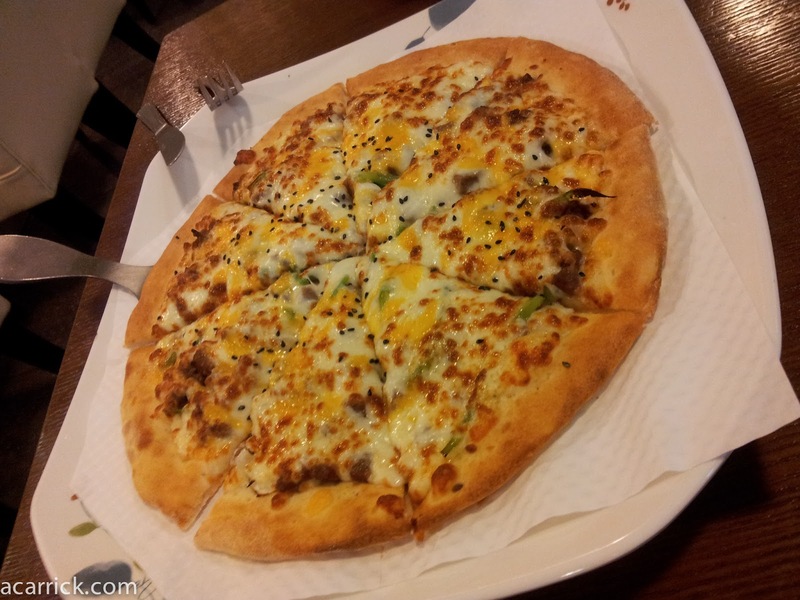 We did however find bulgogi pizza at the Gwangju Bus Terminal. 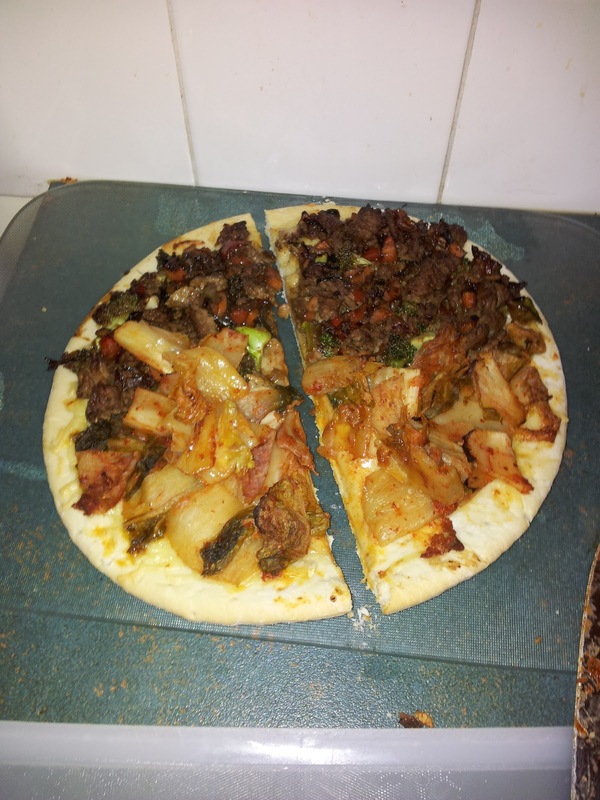 Anyway, so we tried to make our own kimchi pizza. We made half 'n' half Kimchi and Bulgogi Pizza because we didn't really know how it would turn out. You'll have to excuse the quality of the photos - at the time I wasn't thinking of ever sharing these photos so I just used my phone. 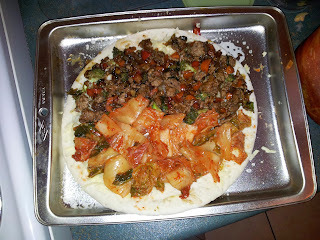 We prepared the bulgogi as usual - bulgogi sauce from the supermarket, beef, diced vegetables. Fried them up. The kimchi we just sliced up a little. We sprinkled the whole base with some cheese just to help everything sick. Since we had some pizza bases and bulgogi left over, we made another smaller one. 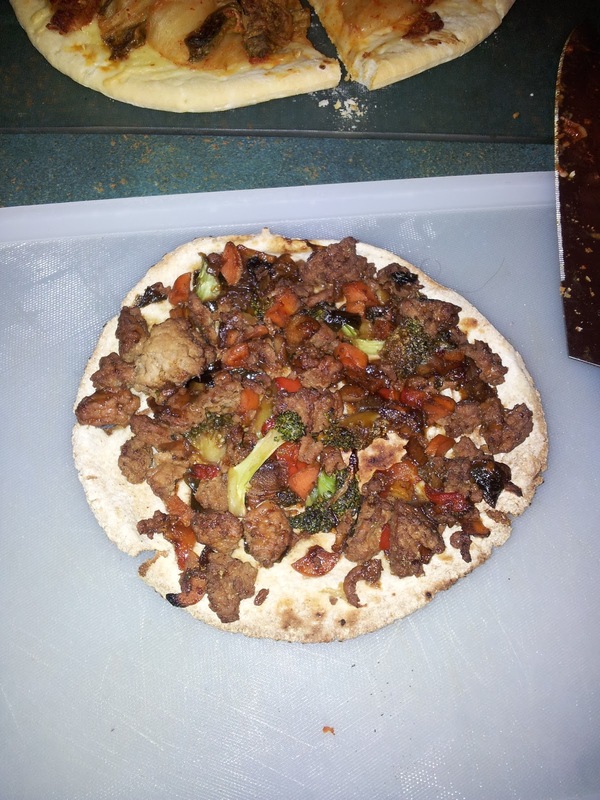 At the time, we enjoyed the pizza we made and of course were excited to eat it. But we could have cut the kimchi up into smaller chunks - maybe fried it with some pork just to give it some some flavour. The bulgogi side turned out well though. In the pizza restaurant I'd imagine they used egg and mozzarella cheese as well as a thick base. I have some other ideas though now and more experience cooking kimchi with other foods so hopefully it will be better if I try it again. 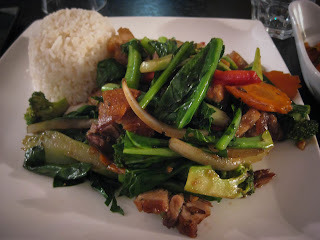 Last week I discovered Yellow Mama Asian fusion restaurant in Morningside. They seem to have all kinds of Asian foods - Korean, Japanese, Chinese, Vietnamese, Thai! I got a Crispy Pork Belly Stir-fry as a main and as one would expect, I got kimchi as an entrée. 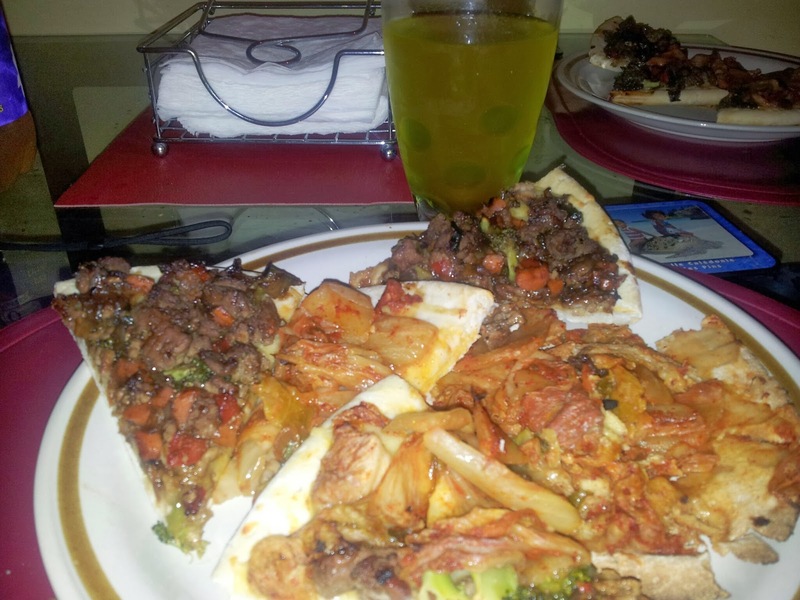 The main meal was very quite good, the vegetables and meat was made with a pepper-sauce, which was a surprise to me. There was a reasonably good amount of pork belly too. And plenty of varied vegetables of different colours. Actually, the whole dish was good value for the $15.90 I paid. The rice was well cooked, and none of it seemed too oily or salty - aside from the pork belly of course, the meal was healthy. Anyway, kimchi is full of good things - garlic and ginger, vitamins etc. Yellow Mama also does homemade ice creams in green tea, coconut and lychee flavour. I hope to try that next time - I was quite full actually! Oddly, there was French music playing while I was dining, but it was nice - pleasant and relaxing, while interesting nevertheless. For a small family owned restaurant I was surprised that while there was a minimum EFTPOS spend ($15, which you'd reach if you had a meal anyway), if you spent under $15, you just pay an extra $0.50 to help cover their EFTPOS fees. I can't begrudge them that - there are extra costs involved, I can't expect the business to wear the costs all the time. If you live nearby they also do a lunch special too. I will definitely go there again one weekend - if only to try the the ice cream! 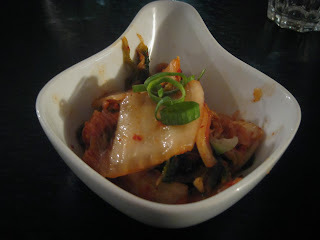 Maybe I'll get a light meal - kimchi jigae (soup) or something to go with the dessert in that case!